Welcome to Opel Engineering! We promise to deliver you the highest quality in machine work, as well as the best customer support. Please feel free to take a look around the site as many of your questions may be answered. We are also proud to showcase some of the project’s we’ve helped to make possible. If you have any further questions, or you would like to place an order, please give us a call! We look forward to hearing from you! Our combined staff at Opel Engineering has well over 75 years of experience. We are responsible for setting over 10 National records. We have 4 national event wins, 4 division wins, a division championship and a runner up world championship. 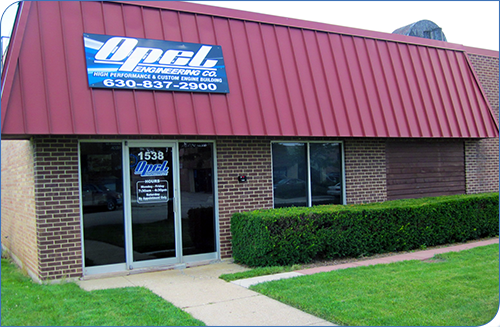 Our Specialty – Custom high performance, marine & race engine building. We specialize in both Import and Domestic engines, with a service history totaling hundreds of Honda, Nissan, GM, Chevrolet and Ford powerplants. From head work to block work, you can count on us to help achieve your goals. Best out of the box cylinder heads we tested with stock exhaust port location. Merlin II Block, Callies DragonSlayer Crank, Oliver Forged Rods, JE Pistons and Rings, Clevite Bearings, Dart Pro-1 Heads, Fel Pro Performance Gaskets, Jesel Sportsman Series Rockers, Cloyes Timing Set, Comp Cam, Crower Lifters, ARP Hardware, ATI Balancer, Moroso Pan & Valve Cover and Dart Manifold Completely Assembled, Internally Balanced and Dyno Tested. Dart Block, Callies Racemaster Crank, Oliver Billet Rods, JE Pistons, Sealed Power Rings, Clevite Bearings, Big Duke or Dart Big Chief Pro-1 Heads & Matching Manifold, Fel Pro Performance Gaskets, Jesel Rockers & Belt Drive, Custom Cam, Crower Lifters, ARP Hardware, ATI Balancer, Moroso Pan and Valve Covers, Completely Assembled, Internally Balanced and Dyno Tested.